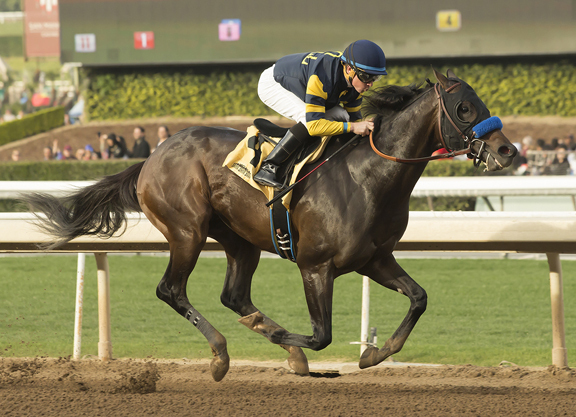 When Hal and Patti Earnhardt homebred Ax Man (Misremembered) won his career bow at Santa Anita by 9 1/2 lengths on New Year’s Day (video), it was extra satisfying for his trainer Bob Baffert, who bred, trained and owns the colt’s Grade I-winning sire. 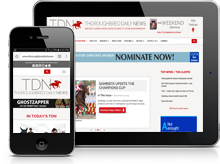 The Hall of Famer also conditioned the sophomore’s stakes-winning dam and most of her offspring, including two-time champion Indian Blessing (Indian Charlie). Ax Man’s dam Shameful has proven to be a blue hen producer for the Earnhardts with eight winners from eight foals to race. Two-time Eclipse winner Indian Blessing was just her second foal and she also produced graded stakes winner Roman Threat (Roman Ruler). With a future booking to Tapit and previous matings to the likes of Candy Ride (Arg), Empire Maker and Midnight Lute, it was a bit unconventional to breed a mare of Shameful’s caliber to Misremembered, whose oldest foals are now 5-year-olds with the best being MGSP Dazzling Gem. Baffert bought Misremembered’s dam Beyond Perfection (Quack), who won the 1990 GII Del Mar Debutante, for just $7,000 at the 2005 Keeneland January sale in partnership with his friend George Jacobs. Instead of breeding Beyond Perfection to Point Given, Sikura convinced Baffert to send the mare to Candy Ride, who was standing his first year at stud at Hill ‘n’ Dale in 2005. Unlike Ax Man, Misremembered was not a standout from the start, at least not in Baffert’s eyes. Baffert even forgot about Misremembered for a while when he had to be laid up, which is how the stallion got his name. Misremembered soon proved to be worth remembering, winning the 2009 GII Swaps S. and GII Indiana Derby and 2010 GI Santa Anita H. The chestnut also finished second to champion Blame (Arch) in the 2009 GII Clark H. and completed the exacta in that year’s GI Malibu S.
Baffert retired Misremembered in 2011 after he was injured when running second in the GII Oaklawn H. and he stood his first year at Hill ‘n’ Dale in 2012. The Hall of Famer moved the now 13-year-old stallion to California last year, standing him at BG Thoroughbreds, and transferred him to Barton Thoroughbreds in Santa Ynez this year. In addition to Shameful and Indian Blessing, Misremembered bred another top mare in Hall of Famer Silverbulletday, who Baffert trained for longtime client Mike Pegram. The California-based conditioner hopes if Ax Man lives up to his early promise, it will also lead to big things for his sire, like more mares of that caliber.